It's been quite a while since I have joined in a blogathon. I used to do it all the time when I was running my film site, The Most Beautiful Fraud in the World, but not since I moved over to my new blog, All Things Kevyn (the one you are looking at right now, btw). Well that all changes right here, right now! The fine folks over at Flights, Tights, & Movie Nights (which is to mean, Mr. Nathan Withrow, aka Bubbawheat - the webmaster behind the great superheroic movie site) are/is having a fresh new blogathon, and yours truly is joining in on the fun. The whole shebang is centered around horror movies and horror comics and horror novels and all that jazz. 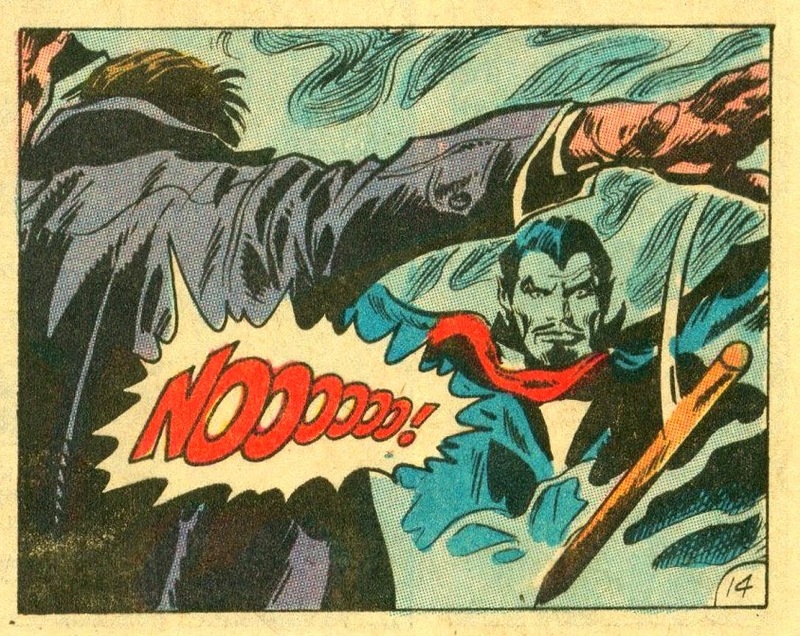 I've decided to go with a look at the classic 1970's horror comic series, The Tomb of Dracula. So, without further ado, I give to you, my humble participatory post in the Graphic (Novel) Horror Blogathon. Have at it. The Tomb of Dracula ran for 70 issues, from 1972 to 1979, and is the most successful comic ever to feature a villain as it's title character. Well, that's pretty cool, ain't it? Actually, Marvel Comics was lucky to get the series going - and it was all in the timing. In 1971, the Comics Code Authority, those so-called bastions of equally so-called comic book morality, relaxed their rather stringent guidelines, and for the first time allowed references to vampires, ghouls, and werewolves. So the gates were opened, and Marvel ran headfirst through them. But even with these newly opened gates, the series was not an instant hit. The title went through five writers in just the first six issues. Stan Lee and Roy Thomas on #1, Gerry Conway on #2, Archie Goodwin for issues #3 & #4, and finally Gardner Fox on issues #5 & #6. It wouldn't be until issue #7, when Marv Wolfman took over as writer, that the series began to edge toward the great success it would eventually become. Wolfman would write the series until its finale, sixty-three issues later, and even though he's done many things since (The New Teen Titans, Infinite Crisis, etc), it is The Tomb of Dracula for which he is most remembered, and most revered. Actually, to make a quick aside in our story, there is an interesting anecdote that involves Marv Wolfman and the aforementioned Comics Code Authority. A few years before he began writing The Tomb of Dracula, Wolfman had been working at DC Comics. DC was doing a horror anthology, and between each story, there were little interstitial pages being written by Gerry Conway. In one of these, Conway jokingly describes a story as being told by a WANDERING WOLFMAN. Since it was all in caps, the Comics Code could not see that this was just a play on words with the writer's name, and therefore, due to its then ban on werewolves (or wolfmen), refused to allow it to be published until the line was removed. DC confronted the Authority, explaining that Wolfman was the writer's name, and eventually they backed down, but only on the condition that DC give credit to Mr. Wolfman in the issue, thereby showing that there was no actual wolfman (or werewolf) involved. This would be the first time that either an artist or writer were given credit on a major comic, and after word got out to other fellow creative types, would start a trend at both DC and Marvel of giving credit where credit was due. But enough of this tale, let us get back to the business at hand, ie The Tomb of Dracula. While The Tomb of Dracula went through writers galore before finally settling upon that wandering Wolfman, the title had its rightful artist from day one. Gene Colan, who was already a big name thanks to his many years on Daredevil, penciled all seventy issues of the comic, and just as he had become the signature artist on the aforementioned Man Without Fear title, he was most assuredly the signature artist on this classic horror title. Colan actually campaigned for the job to then editor Stan Lee. Already promised to artist Bill Everett, Colan drew up a bunch of sketches of Dracula, basing them on actor Jack Palance, and apparently it worked, because the following day Colan had the job - and what a job he did. Of course, I would be remiss to not also mention the great inking work of Tom Palmer (he inked all but six issues) who had already done such great work with Colan on many a Daredevil issue. On such other titles as Uncanny X-Men, the great early 1980's Star Wars series, and especially on Avengers, Palmer would make a real name for himself at Marvel, becoming one of the most prominent and well-respected inkers of all-time. I should also mention Gil Kane's work on the early covers of the series (before having Colan take over as cover artist). Kane though is much more well known for his co-creation of such characters as Iron Fist and the modern version of Green Lantern, as well as being part of the seminal anti-comics code, drug-fueled issues of Amazing Spider-Man that helped to bring about the aforementioned revisions in the Comics Code. But let me jump back a bit and talk about Colan's creation of the character's look. It would have been easy (and probably a bit on-the-nose obvious) to base his update of the then-public domain Bram Stoker-created character, on someone such as Bela Lugosi or Christopher Lee, but that ain't how Gene Colan rolls. No sirree. It was, at least in hindsight, quite genius to base Dracula's look on the great Jack Palance. Oddly enough, a few years later, Palance would actually play Dracula on the screen. Genius, man. Genius. But enough of that, and more on the comic itself. Wolfman and Colan made The Tomb of Dracula a huge success - and one of my own first loves in comics. 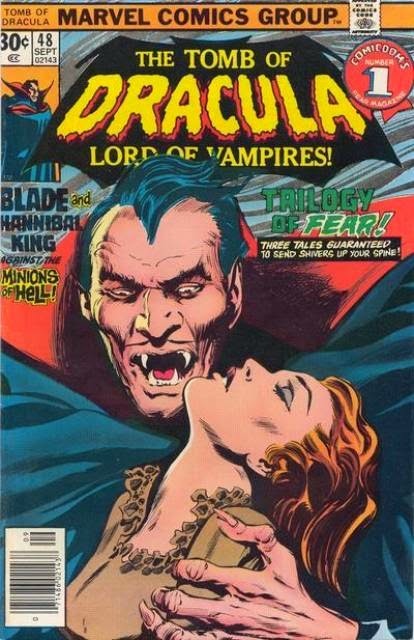 After Avengers and Uncanny X-Men, my first loves as a budding eleven year old comic reader, Dracula was the third comic I really got into way back in 1978. And even today, the title is one of my favourites of which to collect back issues. Other titles co-existed with The Tomb of Dracula, including Dracula Lives! 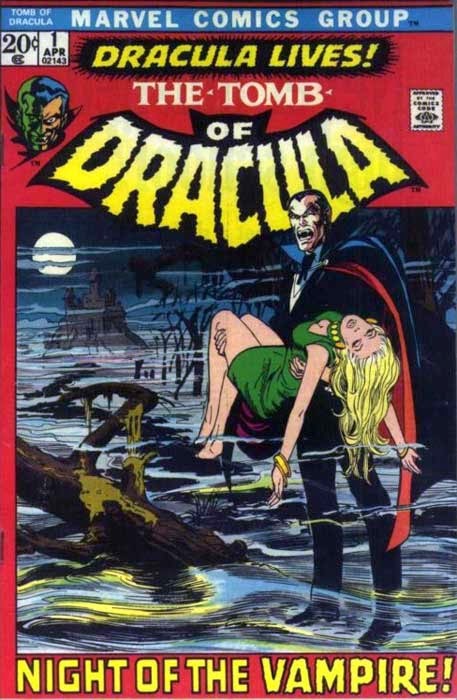 and Giant-Size Dracula, and after this title ended, a new black and white series, also title Tomb of Dracula, came into existence, but only for six issues. This series was also drawn by Colan. DRacula has also been seen around town in crossovers with both Werewolf at Night and Dr. Strange, the latter of which was also drawn by Colan. He would rather famously turn Storm into a vampire in a later story arc in Uncanny X-Men. Wolfman and Colan would come back together again in 1998, with the Dark Horse limited series The Curse of Dracula. I could go on forever here about The Tomb of Dracula, and my love of the comic, including discussing how Wolfman had created the character of Blade, and how he filed (and lost) a lawsuit against Marvel when the Blade movies started coming out, but I should probably stop now before this post gets out of control long. I can ramble on ya know. So, with that said, I want to finish up here by thanking Bubbawheat from Flights, Tights, & Movie Nights, for allowing me to be part of his Graphic (Novel) Horror Blogathon. It's been fun reminiscing about one of my favourite childhood comic book memories. Now I want to go out and gather up some more back issues. To toss out a line or two that actually leans more toward the true essence of the blogathon (I was supposed to talk about horror comics as horror movies after all), I would love to see a movie version of this comic. Yeah, there was an anime version back in 1980, but a live action version would be pretty swell, dontchya think? But I said I was signing off before I rambled on too long, so... That's it gang. See ya 'round the web. That was fascinating. I had no idea! I was stopping by to wish you the best of luck for the A-to-Z Challenge. I am looking forward to your posts. Thanx, and thanx for stopping by. See ya in the A to Z Challenge. Very neat, loved reading about this series. I don't think I've really heard much about this title before now but it sounds really sweet. Thanks for joining in the blogathon! Thanx. Glad to be part of the fun. Come back and visit anytime. I have read a lot of comics in my 25+ year comic reading life, but I do not think I have ever read this one. Heard of it, of course, but never read it. Which is a strange thing considering my unhealthy obsession with vampires. And I mean the real vampires, not those shimmering fancy boys from Twilight. Yeah Es, you should really check this title out. You're one of those rare beings - a girl who is into comic books - so you should do your part and expand that comic book knowledge. Now that I'm back into collecting, Tomb of Dracula is set to be one of my most looked for back issue comic books. Maybe I'll let ya read some next time you are in town. Maybe.